Communities globally are testing new forms of collective processes under myriad political conditions from stable and functional to volatile and oppressive. Political scientists, community organizers and nonprofit organizations see the potential of working directly with constituents to document and analyze the function and effectiveness of these new forms of public participation. Practitioners have historically documented these processes in writing. This effort to capture civic collectivity has been fragmented and incomplete due to the difficulty of sharing documents across languages and political regions. Participedia is an international research initiative and online platform (participedia.xyz) that harnesses the power of crowdsourcing to collect and share emerging data about participatory democratic processes and foster community between activists, practitioners and scholars around the world. The promise of Participedia is to gain perspectives about new methods and collectively elaborate the meanings of new kinds of public participation and their transformative effects on contemporary governance. A project of this scale, however, is not without its design challenges. Participedia’s Design & Technology Team is addressing these challenges through a research-based, agile design methodology including visioning sessions and ongoing input from a community of diverse and distributed political scientists and practitioners to explore and address the primary goals of the project. A significant insight from these interdisciplinary explorations is a recognition that a project about participatory governance would be best served by an open participatory structure of development of the platform itself. 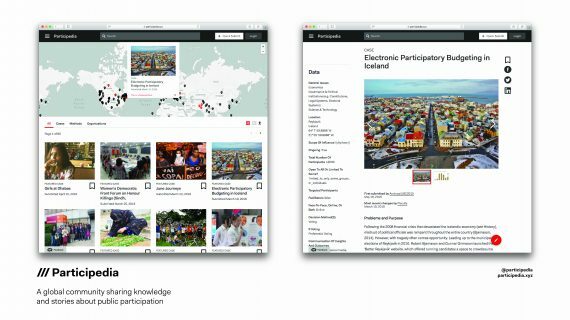 Informed by research, iterative testing and feedback, the D&T Team built participedia using a contemporary technology stack and open source development strategy (github.com/participedia). The site is optimized for mobile, and includes a “quick submit” feature so that anyone can contribute content quickly and easily. The design of the backend data structure allows for accurate localization of content in multiple languages, a forthcoming feature which will enable knowledge sharing across geographic boundaries. This data structure also allows for the addition of varied content types, including a Teaching and Learning Resource Centre that will facilitate the exchange of teaching tools among political science educators around the world. An open source design approach facilitated collaboration, communication and growth of the Participedia community. For example, Canada’s Privy Council has participated on our Slack and Github channels and plans to use Participedia’s data model to collect case studies on public engagement conducted by the Government of Canada, potentially increasing transparency and accountability in addition to improving future opportunities for civic participation. Student developers in the UK gained access to our API and built new features for Participedia. Researchers and assistants across the distributed institutions in the Participedia network have been empowered to engage directly with professionals and practitioners to expand their skills and pursue a wider range of research questions. From its use as a teaching resource to its ability to quickly mobilize knowledge about emergent participatory initiatives in real time, Participedia has the potential to engage a wider public and to change the way we practice and learn about participatory democracy.